Just a little appreciation, it turns out. TODAY Moms teamed up with Parenting.com to survey more than 4,000 parents on the real role of the modern father. Dads think they're working harder than ever on the home front, sharing half the child-care duties and generally pulling their weight. Nearly all moms – 95 percent – say they’re the default “go-to” parent that the kids come running to. But more than a third of dads say no, that’s their role. Among those dads who acknowledge that mom is the go-to parent, nearly a third say it hurts their feeling to play second fiddle. Dads crave recognition: Nearly two-thirds say what they want most from their partner is just some verbal acknowledgment, a "good job" now and then. Meanwhile, 60 percent of moms say, save the verbal pat on the back: They'd rather their partner do something special for them or give them time off from the kids. 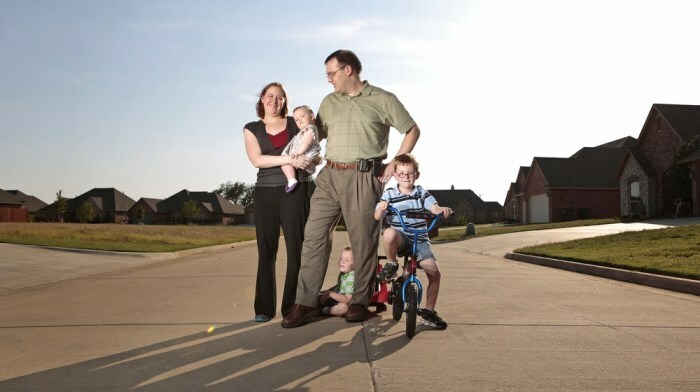 Dustin Baylor and family: As a doctor and devoted dad, Baylor says, "I often feel overwhelmed trying to do it all." What moms don't understand, says Dr. Charles Sophy, a child and adult psychiatrist and director of the L.A. Department of Children and Family Services, is that dads need to hear praise for their child-care efforts – even if the notion sets moms' eyes rolling. "Mothers are more confident in that role; the pat on the back isn't what they're looking for," Sophy said. "Dads need the reassurance. So you say, 'Great job changing that diaper,' and I know moms are like, 'Are you kidding me, what do want, applause?' But if you want him to change four more diapers, you better applaud at some level." Trying, and failing, to live up to moms' demands can be "deflating," says Brock Griffin, a spokesperson for the National Center for Fathering. Still, those high expectations represent a type of progress. "Previous generations of dads were expected to do very little," Griffin said. "So it's progress that dads are expected to do more now. The question is, how much is enough?" Indeed, modern families are often forging new ground when it comes to roles and responsibilities. Dads may not be able to look to their own fathers for a model of how to balance work and home life. Three-quarters say they're more involved with the kids than their own fathers were. Many moms wrote in to say they appreciate all the things their husbands do, but... there's usually a "but." "He does help when it comes to bathtime which is not my favorite thing to do, and helps with the trash and cleaning the toilets. But again, I don't think that a lot of dads realize how much moms do. It took me having surgery and him having to take care of everything to fully grasp what all I do during the concern of 24 hours." "He has sacrificed work advancement to spend more time with our son, and our son is his priority. He picks up and drops off from daycare. However, once we're all home, I still end up handling all of his meals, clean up and bedtime prep, which is a lot in the evenings." So, moms feel overworked and underappreciated, dads feel overworked and underappreciated... are we all just doomed to feel stressed and resentful until the kids leave for college? Resentment is the No. 1 silent marriage killer, said Hal Runkel, author of "Screamfree Parenting" and "Screamfree Marriage." And the expectation gap between dads and moms is a prime opportunity for resentment to build up – but only if we let it. The solution is honest communication, Runkel said, even if the words are difficult to say or hear. "First of all, recognize the resentment," Runkel said. "I have an uncomfortable conversation with my wife at least once a day. We've been married 19 years, and we are not scared of conflict. We are definitely afraid of resentment." Better to get it out in the open, Runkel said. Besides, he noted, when his wife confronts him about some resentment, "it's not like she's such a good actress that she's been able to hide it." Talking it out, he said, "is the only path forward." Of course, dads may have resentment of their own, especially when their child-care efforts are rebuffed because they don't do things "right" - i.e., mom's way. Griffin said mothers should focus on fathers' good-faith effort – even, or especially, when dads do things differently. "Show appreciation for your spouse, look for the positives," Griffin said. "Moms and dads do things differently, and kids need both sides. As long as the kid isn't actually in danger, give him the space to do it his way." So even if you think his bedtime stories are way too scary, he uses 20 wipes to change a diaper, or his idea of dressing your daughters involves orange plaid and purple polka dots, give up the mom perfectionism and let dad find his own parenting style. "I have struggled and while I love my kids dearly, they have each pushed me beyond any objectively reasonable limit at various points throughout their respective childhoods. Yes, they are growing and testing but I have been pushed to the edge so many times. I mean sometimes I have felt like you need to have the patience of Gandhi to survive the process." TODAY Moms senior editor Rebecca Dube notes that Gandhi had five children and wonders if he ever had a "laptop-shooting dad" moment of his own.